This is the drafting table of a working man. An illustrator who strapped it on and drew for hours every day, for decades. Who put in the labor, the sweat, the effort it takes to be great. Yes, Jack Kirby was a genius, but genius without work is nothing. Look at the darkened areas where he rested his arms. Do you know how much time it takes for a board to take on that kind of color? It's the result of day in and weary day out, leaning on his desk to add just a little more krackle, or those extra lines that would really sell the panel. Look at the blinds, closed. Sometimes you have to shut out the real world when you're creating whole new ones. Look at that little sideboard, beaten and battered to hell from being shoved around wherever it was needed, with drips and drabs and stains from being put to use over a great period of time. 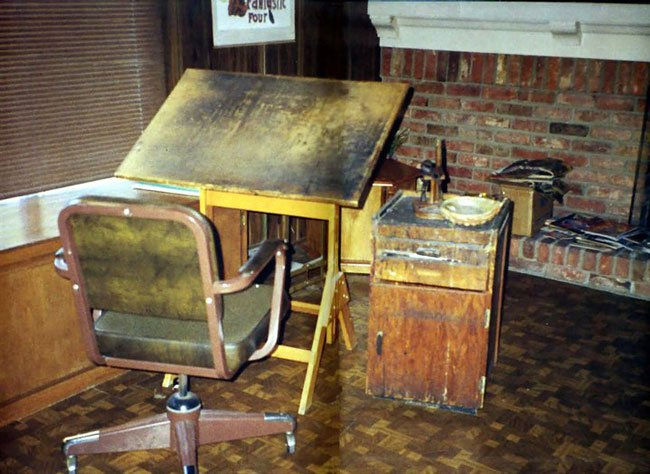 From this humble throne, Jack Kirby created characters and stories that not only inspired millions (including yours truly), but which today are worth billions of dollars. Billions. Of dollars. From that small, weathered, beaten-down drafting table and sideboard. And that's why I love this photo. Because it shows that you don't need the most expensive computer in the world, or a lavish studio, or the latest and greatest gadgets. What you need is a willingness to roll up your sleeves and get to work bringing your imagination to life. Now get out there and become your own King or Queen. This entry was posted in Comic Book Stuff, Randomosity. Bookmark the permalink. The mighty Jeff graces us mortals with his presence! Strong pic! Does this inspire you to draw again?…hmmm? My first impression was that it was a scene from a post-nuclear apocalypse!